With the release last night, Mashery has added yet another useful feature based on your feedback! CORS (Cross Origin Resource Sharing) is a W3C standard that defines how browsers and servers can interact with one another and provides a mechanism for web applications to make requests to a resource in another domain. All major browsers support this standard. Mashery has made it easy to leverage this standard with just a few button clicks and without requiring changes to your back-end API server. 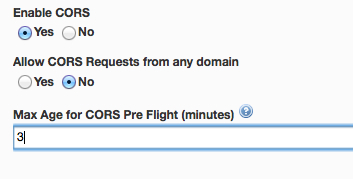 In addition, by using this optional feature available in Mashery, you can offload pre-flight request / response management to Mashery. That is, if a valid pre-flight request comes through, Mashery will prepare an appropriate pre-flight response with the right headers as well as perform the necessary validations on whether the requested method is allowed on the API end-point.